When Nusse jumps my lap, she usually bonks her head right underneath my chin where after she licks my throat and face. Is this just love or is there another reason for it. Let’s find out why cats lick people. First of all, cats mark all of their property with pheromones. Yes, you are also their property now, but that is nothing new to you, is it? You do keep washing yourself and smell different each day, so we need to mark you to be property again. Is it really only about property? No, it is also about knowing and identifying what is known or safe and what is not. Cats lick also other family member cats to take care of each other. Being licked by a cat can easily mean they are accepting you as their family member. Grooming is a big part of the day spending of a cat. Nearly 50% of the time of the day that they are awake, they spend on grooming. Grooming others is part of that schedule too. So when they start to lick you, they might just be taking care of you. They might find that you need some grooming and will clean you and make you look great again. It is also in their instinct to take care of for example those that are ill or the young kittens in their litter. It definitely also means that you are loved by your cat when he or she licks you. While the skeptics will say that animals do not love us, I am a strong believer that all animals that have felt love from us, do love us back. I have noticed not just with the usual pet at home, but also with the animals we saved in nature. Cats love each other and show that through licking or grooming as it is called. Just as they do this with their children or their loved ones, they will do this with us. There is still a slight chance they lick you, because they smelled or noticed something that smells or tastes nice on you. It doesn’t even have to be a tasty food type such as fish or chicken on your fingers. Even a bit salt of that is naturally on our fingers can attract cats’ senses. What about cats that lick you after a shower? Well, first of all you could have still some water on your skin. They find it interesting to find water on your skin to lick off. There is also a chance that they are attracted to an ingredient to one of the shampoo’s or soaps. It won’t be harmful though, because that soap is most likely already gone from your body. An occasional lick on your body is very okay, but when licking becomes excessive behaviour, something else is the matter. 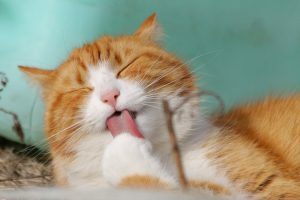 It might be your cat is experiencing some environmental stress or there is something wrong with their health, that is causing them to lick so excessively. Our cat Tiger was at some point licking himself excessively, making his hair disappear. It appeared to be an external stress when we were living in the city, because now that we moved to the country side, his hair has grown back and he has calmed down. Environmental stress can be caused by a different cat in the neighbourhood, a new baby born in the family, change of furniture or different smells in the house. Also, the death of another pet can be the cause. It is even possible that they get excessive at licking by food allergies. 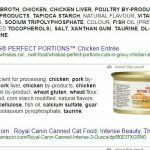 These food allergies are often caused by certain ingredients that are in cat foods and cat treats, such as corn flour or E-numbers. A kitten that we had staying with us from the RSPCA had lost its mother on a too young age. This resulted in the kitten licking and suckling on wool, soft beds, soft blankets and pillows excessively. Those pieces of textile were soaking wet from it. This behaviour usually cannot be stopped. A proven method to reduce environmental stress for cats in the house is by installing a pheromone diffuser in your house. The pheromone diffuser spreads a calming smell in the house that helps calm down your cats and can lead to a reduction of destructive behaviour. Another way to deal with excessive or compulsive licking behaviour is to train your. It is important to make your cat understand it is not okay to lick you. You do this by just leaving whenever the unwanted behaviour is started. Whenever they start licking your arms and hands, you get up and go. For this training to be effective, it needs to be maintained that way for several months. You could also use clicker training. For clicker training, you click each time the right behaviour has been performed. Another way is to treat the cat with treats, but I am not the biggest fan of this method, as it will condition them to get more treats. Giving excessive amounts of treats can lead easily to obesity in cats. You can also distract your cat with something like a toy or some cat nip spray or herbs. Often cats can get bored, so keep on playing with them. They need the physical stimulation that hunting sport and play offer. Whether there is a solution to licking problem or not, it is most important to be patient around your cat. When you are training your cat for a new behaviour it requires a lot of patience from your end. Patiently paying attention can also teach you the actual trigger for the behaviour so that you can do something about it. 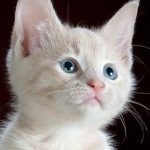 Do not raise your voice or be rough with your cat, as that can worsen the symptoms and the stress of the cat.